Coaches depart at 10 am, you should be at the meeting point by 9.45 am. This tour will operate on Thursdays and Fridays from April to October. We are comparing FC Bayern Munich Football Stadium tour and Allianz Arena Prices from leading ticket suppliers and Try to find you Cheap tickets prices on the market. Take a tour of the city of Munich with a little football flavour. 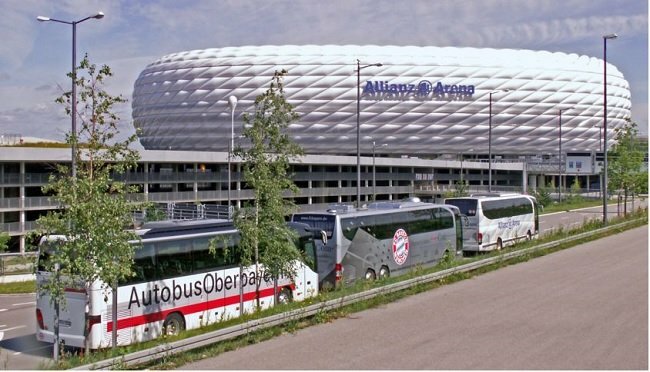 On this 4-hour excursion you will travel in comfort by luxury air-conditioned coach to the Allianz Arena, visiting the Munich's most interesting and important city landmarks on the way. While onboard you'll have the company and bilingual commentary of an excellent local guide who will get you up to date of the facts and fictions of the Bavarian Capital. Hear about the ‘mad' King Ludwig II as you drive past the neo-classical Konigplatz and the famous artists whose works are exhibited at Lenbachhaus and other city art galleries. You'll also pass the Bavarian National Museum, Angel of Peace statue, and the Pinakothek. On the way out of the city you'll make a stop for a tour of Munich's professional training grounds, before continuing the Allianz Stadium. Designed and constructed for the Football World Cup on 2006 this German stadium has hosted games from players of all nationalities but is the primary home of the local FC Bayern Munich team. After a guided tour of the arena you'll have the option of visiting the FC Bayern Experience, for football fans this is a must, and time to browse the fan shop before returning to Central Munich by coach. If you're a football fan, or you're travelling with a football fan, then this tour is absolutely tailor-made for you, during the 4 hours you'll tour one of Europe's best stadiums and have the options of visiting the FC Bayern Experience. Unfortunately this tour is not practical for wheelchair users. Your Experience With FC Bayern Munich Football Stadium tour and Allianz Arena? Live out your football fantasies on a visit the famous Allianz Arena, or Olympic Stadium. Tour the training ground where your favourite football players hone their skills and shop for souvenirs in the FC Bayern Fan Shop. Have the option of visiting the FC Bayern Experience and learning about the Champion League players. Travel stress-free on an air-conditioned coach to the Arena and learn about the city of Munich from a bilingual tour guide. What FC Bayern Munich Football Stadium tour and Allianz Arena Includes? Expert bilingual guide (English, German). Tour of Allianz Stadium (or Olympic Stadium on match days). Return transport from Munich Hauptbahnhof by air-conditioned coach. The Munich City Tour Card includes discounted entry to the FC Bayern Experience. Travelers Reviews about FC Bayern Munich Football Stadium tour and Allianz Arena? The Allianz Stadium and Munich city tour has mostly positive comments from eager football fans saying that their ‘dream has come true'. Comments say that the tour is well organised and most agree that the guides are enthusiastic. Negative comments have been made about the tour being in both English and German, and a few unsatisfied visitors were unaware that their tour would be to the Olympic Stadium instead. To avoid any problems check all the tour details before booking and avoid booking this tour on match days. Tickets will be received via e-mail. Please bring your printed ticket or E-ticket. All tickets purchased through Viator are fully refundable up to 7 days in advance, any cancellations made less than 7 days in advance will be subject to charges. Tickets purchased through Get Your Guide are fully refundable up to 24 hours in advance of tour. This is a bilingual tour and will operate in English and German. This tour will not visit the Allianz Arena on match days, instead, participants can visit the Olympic Stadium. Entrance to the FC Bayern is optional and the entrance fee is not included in the tickets price. Entrance fees: €12 (Aged 13+), €6 (aged 6-12), free for children under 5. Meeting Point: In front of Karstadt department store, located opposite Munich Central Train Station, Hauptbahnhof. Please check you booking confirmation for exact meeting point.